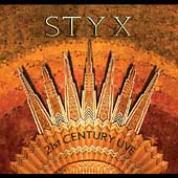 Members Styx: Lawrence Gowan (vocals, keyboards, synthesizer); James Young (vocals, guitar, background vocals); Tommy Shaw, (vocals, guitar, background vocals); Glen Burtnik (bass, background vocals); John Panozzo (drums, percussion, background vocals). Notes Early releases included a DVD of select show. This can be found in the Video section of this site.